I decided to use my new baby to make a Christmas tree skirt. I had a fq of each of these Michael Miller Christmas fabrics. A yard of the dots for the binding, a yard of the trees for the backing and I'd say a little less than a yard of Kona white for the blocks and sashing. I still have some left over block pieces to play with in some other project ideas I have been thinking about. And out pop your pieces! Brilliant!!!!!!! I am certain there are some quilters that can sew these without pinning but I am not one of them. I needed that extra staying power of the pins. That and my fat fingers kept getting in the way. After pinning assembling the blocks is super easy. Start at the same place you starting pinning and sew around. I think of it from left to right. This is what one quarter of your block will look like. Press seams opposite to make lining up easier. This works for me but I know other people like seams open. I decided to use a skirt that I already have for a template. And I increased the size of the opening for the tree truck. I used a small Revereware pot lid that I have. It was then that I decided that the fabric was screaming for something... RICK RACK or ric rac :o) The local fabric store was out of the by the yd kind so I bought five of these and only needed three. Always nice to have leftovers. Sewed it on one row at a time. This is when I decided to add the sashing. I could not find an online tutorial for sashing for a circle quilt so I just made 4 inch bias cut binding strips that I attached with more ric rac. Once you start with ric rac it is really hard to stop! This is when I discovered that when you add four inch binding to a circle quilt you get a Christmas tree BOWL! I ended up folding it in half and that made it much more manageable. Then I pinned the edges into submission!!!!! I quilted it and then traced the opening of the skirt onto the quilt. Here is where I learned a really great lesson...figure out how and where you are putting your ties before you add your binding. If I were to redo this part I would have marked where my ties were going and added them on the way. I added my ties about one inch down from the corner under the binding and then secured by flipping it back over the binding and sewing it down. After the ties are on then you are DONE!!!!!! I cannot wait to see this on my tree this year!!!!! So fun! 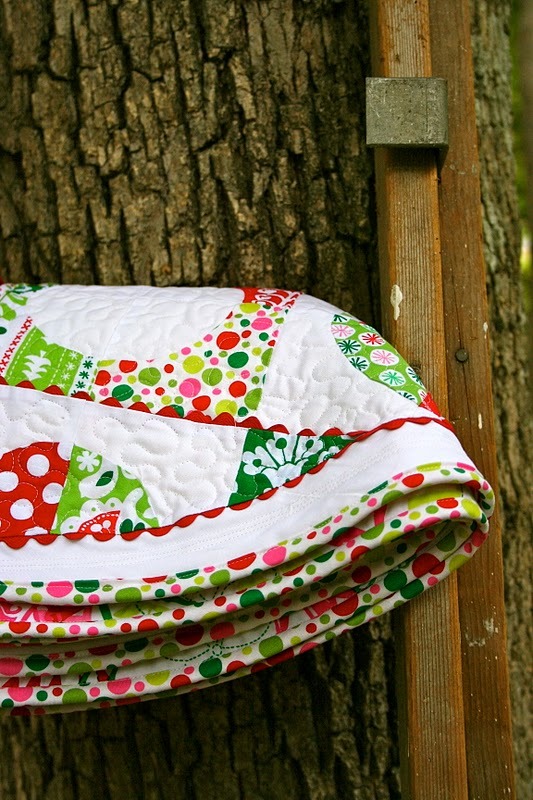 We LOVE that Christmas tree fabric you used on the back!! Love the Ric rack and the circle design. I have a pattern from MamaCJT I need to get crackin' on too! AWESOME!!! Omg so cute about the mug rug, what a great idea! I Knew it would turn out great (am I allowed to laugh good-naturedly at Frank?)! How stinkin' cute is that? I love using leftovers for something new! So festive and cute! I've been on the lookout for a Christmas tree skirt, and I love this one! What else do I love? The doughnut-hole mug rug! Fabulous! LOVE it! I need to make a tree skirt for myself—this might be the one! Thanks for sharing! Hi! This is the most beautiful Christmas tree skirt I have seen!!! Beautiful and I love also the back fabrick and the mugrug is perfect! Oh that is soooo nice! I'd love to make a tree skirt. I'm afraid of picking the wrong fabric! Same reason I haven't made stockings yet! This is so sweet!! I love the skirt and the fabrics - and you have a great tutorial too!! stop it!! that is ridiculously cute! I love the ric rac. I love ric rac on everything! It looks so well made and finished. Way to go! Seriously love the tree skirt! I want to make one! LOVE! I have to say this is awesome. What a great job and tutorial. LOVE IT! That circle die is and has been at the very top of my wish list for a long time now so now I KNOW it's a definitely needed die. And that leftover circle for a mug rug is adorable. OMGoodness that is so cute! Thanks for the tute and love the mug rug too. Oh and I forgot to say that I would love to have a Go Baby! I just became and new follower and would appreciate a follow back. Thanks! I love this and ordered all my Michael Miller fabric last night to make one! How large are your squares? I don't have the Go Baby so was going to cut squares, then cut the circles out and cut them both in quarters after. Hope mine turns out looking half(or a little more;) as good as yours! Beautiful! Otherwise, understanding the parts and working mechanism of an electric hot water will help in identifying the defects and troubleshooting them easily. These are generally made of durable, high quality stainless steel, molded into modern, yet functional, designs. Some comprehensive studies are now showing that there are over 2,100 toxins in our drinking water.